Know someone who has a Pomeranian? 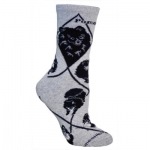 Stop by Island Paws and pick up these adorable gray socks! Wheel House Designs' cushioned socks are soft terry loop construction, which protects feet and reduces the shock of impact. They are engineered to provide protection against blisters and wicks away moisture to keep feet dry. Acrylic, the most widely used fiber for athletic socks is soft, washes well and holds its shape. This style of socks makes a great sneaker sock. Perfect for hiking boots too. Know someone who has a Mini Pinscher? 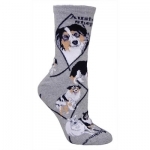 Stop by Island Paws and pick up these adorable gray socks! Wheel House Designs' cushioned socks are soft terry loop construction, which protects feet and reduces the shock of impact. They are engineered to provide protection against blisters and wicks away moisture to keep feet dry. Acrylic, the most widely used fiber for athletic socks is soft, washes well and holds its shape. This style of socks makes a great sneaker sock. Perfect for hiking boots too. 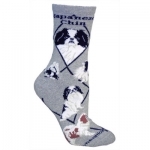 Know someone who has a Japanese Chin? 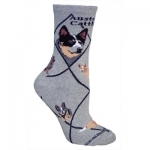 Stop by Island Paws and pick up these adorable gray socks! Wheel House Designs' cushioned socks are soft terry loop construction, which protects feet and reduces the shock of impact. They are engineered to provide protection against blisters and wicks away moisture to keep feet dry. Acrylic, the most widely used fiber for athletic socks is soft, washes well and holds its shape. This style of socks makes a great sneaker sock. Perfect for hiking boots too. Know someone who has a Great Dane? 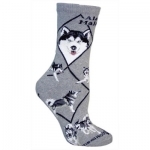 Stop by Island Paws and pick up these adorable gray socks! Wheel House Designs' cushioned socks are soft terry loop construction, which protects feet and reduces the shock of impact. They are engineered to provide protection against blisters and wicks away moisture to keep feet dry. Acrylic, the most widely used fiber for athletic socks is soft, washes well and holds its shape. This style of socks makes a great sneaker sock. Perfect for hiking boots too. Know someone who has a Dachshund? 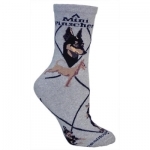 Stop by Island Paws and pick up these adorable gray socks! Wheel House Designs' cushioned socks are soft terry loop construction, which protects feet and reduces the shock of impact. They are engineered to provide protection against blisters and wicks away moisture to keep feet dry. Acrylic, the most widely used fiber for athletic socks is soft, washes well and holds its shape. This style of socks makes a great sneaker sock. Perfect for hiking boots too. Know someone who has a Dalmation? 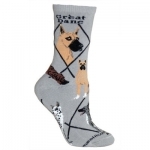 Stop by Island Paws and pick up these adorable gray socks! Wheel House Designs' cushioned socks are soft terry loop construction, which protects feet and reduces the shock of impact. They are engineered to provide protection against blisters and wicks away moisture to keep feet dry. Acrylic, the most widely used fiber for athletic socks is soft, washes well and holds its shape. This style of socks makes a great sneaker sock. Perfect for hiking boots too. Know someone who has an Australian Cattle Dog? 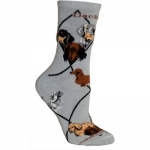 Stop by Island Paws and pick up these adorable gray socks! Wheel House Designs' cushioned socks are soft terry loop construction, which protects feet and reduces the shock of impact. They are engineered to provide protection against blisters and wicks away moisture to keep feet dry. Acrylic, the most widely used fiber for athletic socks is soft, washes well and holds its shape. This style of socks makes a great sneaker sock. Perfect for hiking boots too. Know someone who has an Alaskan Malamute? Stop by Island Paws and pick up these adorable gray socks! Add a unique touch to your home or even give as a gift! 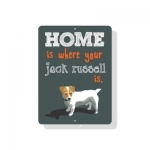 This adorable sign will make anyone crack a smile even on their worst days, especially if they're a Jack Russell fan! Like all of Bainbridge Farm Good's signs, their, Home is Where Your Jack Russell Is, sign is fully waterproof, UV resistant and mounted on heavy duty aluminum – think street sign durability! Proudly made in the USA on Bainbridge Island, Washington. Add a unique touch to your home or even give as a gift! This adorable sign will make anyone crack a smile even on their worst days, especially if they're a Bernese Mountain Dog fan! 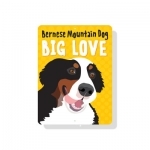 Like all Bainbridge Farm Good's signs, their Bernese Mountain Dog sign is fully waterproof, UV resistant and mounted on heavy duty aluminum – think street sign durability! Proudly made in the USA on Bainbridge Island, Washington. Add a unique touch to your home or even give as a gift! This adorable sign will make anyone crack a smile even on their worst days, especially if they're a Golden Retriever fan! 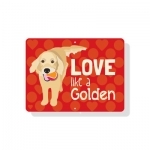 Like all Bainbridge Farm Good's signs, their Love Like a Golden sign is fully waterproof, UV resistant and mounted on heavy duty aluminum – think street sign durability! Proudly made in the USA on Bainbridge Island, Washington. Add a unique touch to your home or even give as a gift! 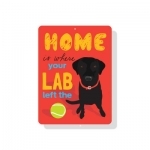 This adorable sign will make anyone crack a smile even on their worst days, especially if they're a Lab fan! Like all Bainbridge Farm Good's signs, their Home is Where Your Lab Left the Ball sign is fully waterproof, UV resistant and mounted on heavy duty aluminum – think street sign durability! Proudly made in the USA on Bainbridge Island, Washington. Add a unique touch to your home or even give as a gift! This adorable sign will make anyone crack a smile even on their worst days, especially if they're a Corgi fan! 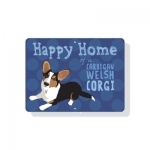 Like all of Bainbridge Farm Good's signs, their Happy Home of a Cardigan Welsh Corgi sign is fully waterproof, UV resistant and mounted on heavy duty aluminum – think street sign durability! Proudly made in the USA on Bainbridge Island, Washington. Add a unique touch to your home or even give as a gift! 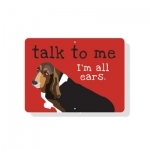 This adorable sign will make anyone crack a smile even on their worst days, especially if they're a Basset Hound fan! Like all of Bainbridge Farm Good's signs, their Talk to Me - I'm All Ears sign is fully waterproof, UV resistant and mounted on heavy duty aluminum – think street sign durability! Proudly made in the USA on Bainbridge Island, Washington. Add a unique touch to your home or even give as a gift! This adorable sign will make anyone crack a smile even on their worst days, especially if they're a Beagle fan! 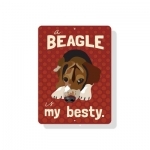 Like all of Bainbridge Farm Good's signs, their Beagle is My Besty sign is fully waterproof, UV resistant and mounted on heavy duty aluminum – think street sign durability! Proudly made in the USA on Bainbridge Island, Washington. Add a unique touch to your home or even give as a gift! This adorable sign will make anyone crack a smile even on their worst days! 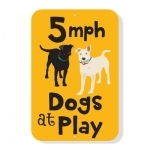 Like all of Bainbridge Farm Good's signs, their 5 MPH Dogs at Play sign is fully waterproof, UV resistant and mounted on heavy duty aluminum – think street sign durability! Proudly made in the USA on Bainbridge Island, Washington.